This is my last week working with the Invasive Animals CRC. I am taking up a job at the Australian Centre for International Agricultural Research. It was a very hard decision to make, but the offer was too good to refuse. I have totally enjoyed my work here with the CRC. The duties have been diverse, the autonomy is great, but mostly I have loved working with a terrific bunch of people. Many I’d refer to as friends and not just colleagues. Exciting times are ahead for the CRC and it does make me sad not to be a part of it. My colleagues have said they'll miss me, and that I've been an important part of the CRC's core staff. They say I've brought much energy (meaning I drink too much coffee - I have given up this addiction in my time here) and expertise to the Communications role (meaning I was at uni for many hours that I should have been working) during my time with the CRC. It has been brilliant working with this organisation. So long and thanks for all the fish, even though it's carp we're harvesting. There was a great story on ABC's Landline from the past weekend on how this rather rainy season has resulted in a burgeoning carp population in Australian rivers. Watch the segment here. Reporter Chris Clarke has looked at the latest efforts to control this major pest. Some of the control methods featured include IA CRC projects for pheromone attractants, optimised carp separation cages and daughterless carp. The segment also focuses on IA CRC demonstration sites. IA CRC participants, Keith Bell from KC Fisheries, Dean Gilligan from Industry and Investment NSW, Chris Wisniewski from Inland Fisheries Tasmania and Ron Thresher from CSIRO are interviewed for the segment. The segment is a terrific overview of current initiatives. Wayne Fulton, Freshwater Products and Strategies program leader at the Invasive Animals CRC comments that it's important that they be seriously considered if carp are to be controlled. Posted by Alexandra Bagnara, IA CRC Communications Manager. Well... the Invasive Animals CRC's new CEO, Andreas Glanznig, is already kicking goals in his new role. Our rebid (the IA CRC beyond 2012) is really taking shape under his leadership and he's been studiously conducting his homework in preparation for briefing an array of stakeholders. Andreas is getting out and about in the media as well. A 'Canberra Times' article published on 21 September provides some background on his extensive experience and credentials, referring to him as a 'shrewd thinker leading the war against feral pests'. Later, he was referred to as a 'lean, green fighting machine'. Professor Tony Peacock has resigned from the position of CEO of the Invasive Animals CRC to take the reigns as CEO of the Cooperative Research Centres Association. Our new CEO, former Chief Operating Officer Andreas Glanznig, brings a wealth of experience to the position, but it is doubtful he will tweet, facebook or blog with the same vigour and zeal as our former leader. 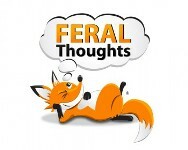 Never-the-less, the staff at the IA CRC will try to continue blogging to keep the Feral Thoughts readers informed and up-to-date on happenings in the realm of invasive animals. Tony's efforts should not be understated and we have mighty big shoes to fill. So passionate and enthusiastic was he in communicating the work of the CRC and commenting on an array of feral issues, that he received a prestigious Eureka Science Award for Promoting Understanding of Science.